The other day a young friend asked me what programming language she should learn, to get a high paying job as soon as possible. I asked her to concentrate on data-structures, algorithms and problem-solving skills in general, instead of focussing on learning one programming language. But the question still seemed important. I wanted to know what the typical American programmer programs in? How much does she earn? Where is the best place for her to live in? So, I did my own little 'research' using Google and other websites. Here is what I found. Note that all this data is based the past 12 months (May 2013 to May 2014). I am focussing on 5 very popular programming languages: Java, Python, Ruby, C# and PHP. I am also focussing on the following 5 states: Florida, North Carolina, California, New York and Maryland. 1. What is the most preferred programming language? So, that is what Americans want to learn. 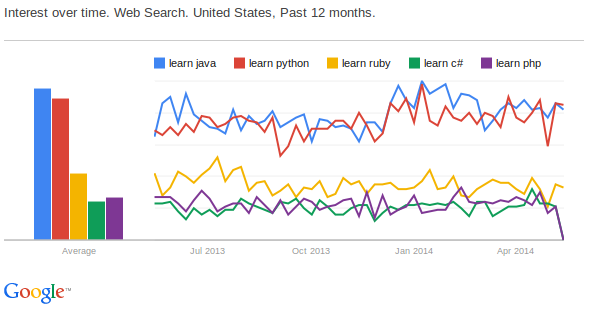 Java is clearly the winner here, followed rather closely by Python. All the other languages are far behind them. I am sure one of the main reasons for this is Android. You can't be an Android developer without knowing Java. Moreover, a lot of enterprise systems are still written in JEE. However, a lot of developers from third world countries are Java programmers, and they sure are cheap, so I am assuming the salary of a typical Java programmer won't be very high. We will know if that is actually the case next. 2. What is the average salary of programmers in these languages in the US? The salaries shown here are the national averages, for that exact designation. So, seniors and associate programmers are bound to get higher or lower salaries. As expected Java developers are paid the least. Now, I am talking about just Java developers (not Android or JEE specialists.) Python and C# seem to be the languages to learn, if you are interested in high salaries. 3. What is the average salary of programmers in these locations? Here, I am considering the average salary of a "Web Developer". This designation is likely to include most of the languages that I mentioned. So, Florida is the state with the lowest salary, and New York is the one with the highest. This is expected, based on the cost of living in those states. Based on these, I have come to the conclusion that my young friend should learn Python, and move to New York. The chances of her finding a good job seem to be the best there. But hey, we all should only do what we are interested in doing, and live only where we want to live! So these were merely suggestions. But I had more questions. What are the salaries in other countries like, compared to the US. Surprisingly, much of the world earns far less than what Americans earn. Here is what I found. Very interesting indeed. But what are the salaries like in the third world countries, you ask? Note that those are the yearly salaries of people there. It is more than obvious why companies prefer to outsource projects now. I have gathered all data from online sources only, so you can always look it up. Some numbers have been rounded off to the nearest 100. That is all for now. Please do leave comments and share.